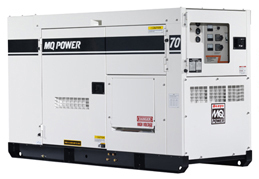 The DCA-70SSIU2C sports 77kVA/62kW standby output and 70kVA/56kW prime output. The generator is powered by a 4-cylinder, 2999cc Isuzu BJ-4JJ1X diesel engine and the unit controls voltage regulation to +/-1.5 percent no load to full load. Sound level is a whisper-quiet 68 dBA full load at 23 feet and it has a 40-gallon (151 liter) fuel tank.